I want to share with you a couple of ways to “transfer” lettering/wording to our wool projects…To be honest I can draw the words/lettering on with my dependable Clover white liquid chalk marker on most anything…but sometimes you want something just perfect…In the case of this Angel Tree Skirt I wanted the FONT to turn out exactly like the computer prints it out….so I’ve heard Glad Press’n Seal was the answer…So I gave it a try… With a medium tipped Sharpie marker I traced the design from the book, along with the bottom edge of the mat for accurate placement. I then “pressed” the Press’n Seal onto my wool mat. With a #8wt. perle cotton and a#22 Chenille needle I started stem stitching my letters right through the press’n seal…as you can see I didn’t want to stitch too much before I knew if this was going to come off…I took my small extra sharp Dovo scissors and cut away the PnS as close as I could to the stitching. I then proceeded to take my extra sharp tweezers and pull away the PnS from the outside of the letters and insides. Awesome!….It was going to come off…was it easy? It was kind of picky and sticky coming away from the stitching, but the results were beautiful. 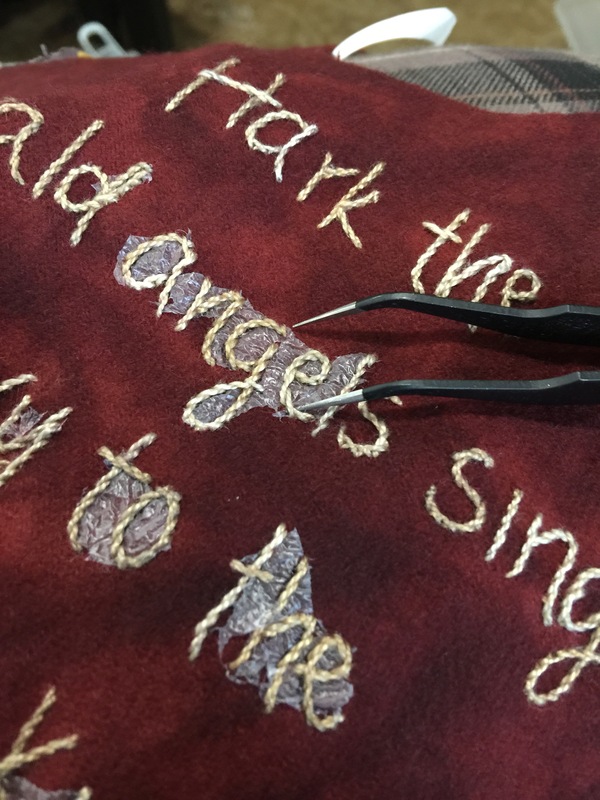 Now I thing the biggest reason it worked is because my stem-stitching was nice and close together…a little smaller than I usually stitch…mostly because these were tiny lettering…and to make it pretty it had to be tiny…. 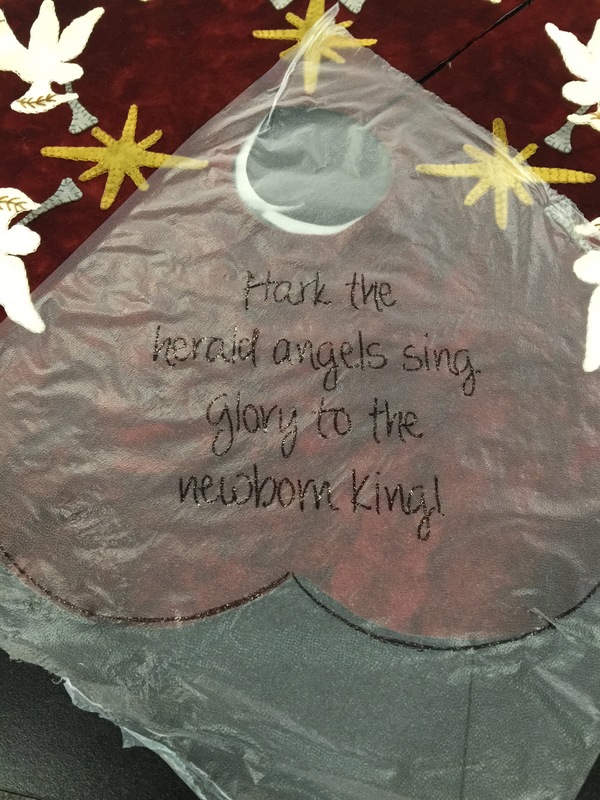 Now..for the next step…I am stitching this same Angel Tree Skirt as FULL sized tree skirt!!! I blew up the pattern as stated in the directions…it comes out to 42″. The perfect size for a full size tree…The wool for the background had to be specially dyed because I needed more than 1 yard…I think we dyed a 50″x 6o” piece of wool to get the 42″ after it was dyed. Wool shrinks/felts in they dyeing process to you have to account for that shink-age. So my final summary is this…If I need something to be perfect, I will use the PnS…If it doesn’t matter and I want to do it in my own hand I will skip the PnS because it isn’t really that fun to pull all that stuff out from the words/lettering…but it does work for those who do not care for their own lettering…and for those “perfectionists” out there. So it’s a very accurate means of transferring the word/lettering on to our wool projects. 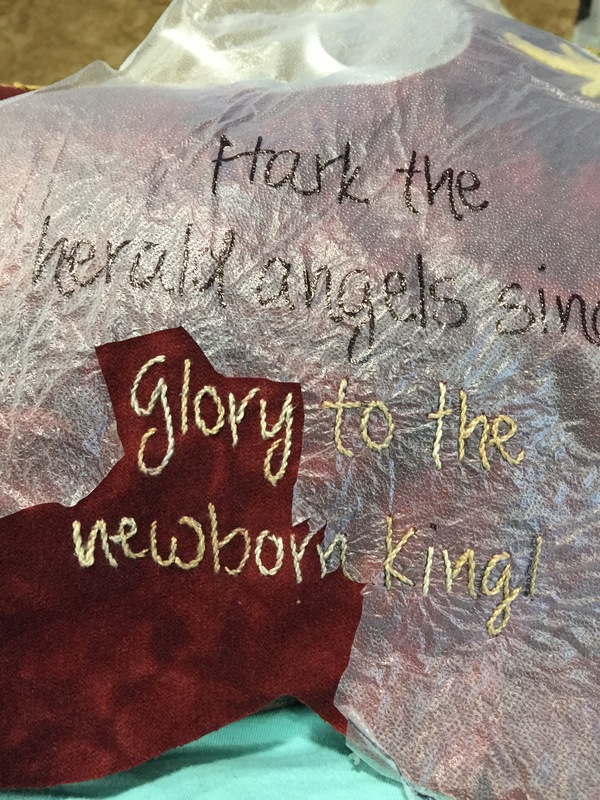 A couple other methods I have used in the past have been tissue paper…you would baste the traced tissue paper onto the design and then stitch on it…then wet it when compete and put it away…this comes off easier, but it is a little more awkward to stitch through. Then the final way has been to use “tulle”. You would trace the words onto the tulle with a marker. 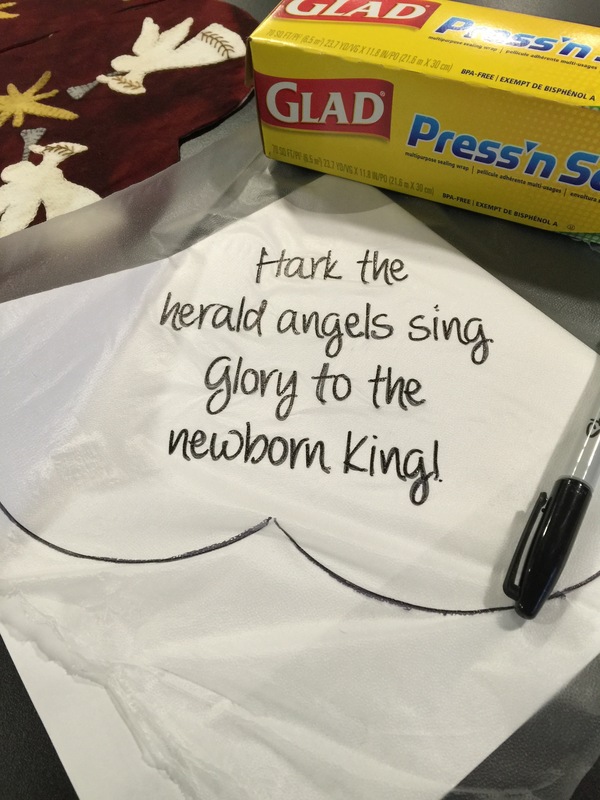 Then place the tulle onto the wool and trace the words again using the liquid chalk market or the fixion pens that are now available. I hope this helps when determining how to get those words onto your dark wool backgrounds that you cannot use a lightbox for. 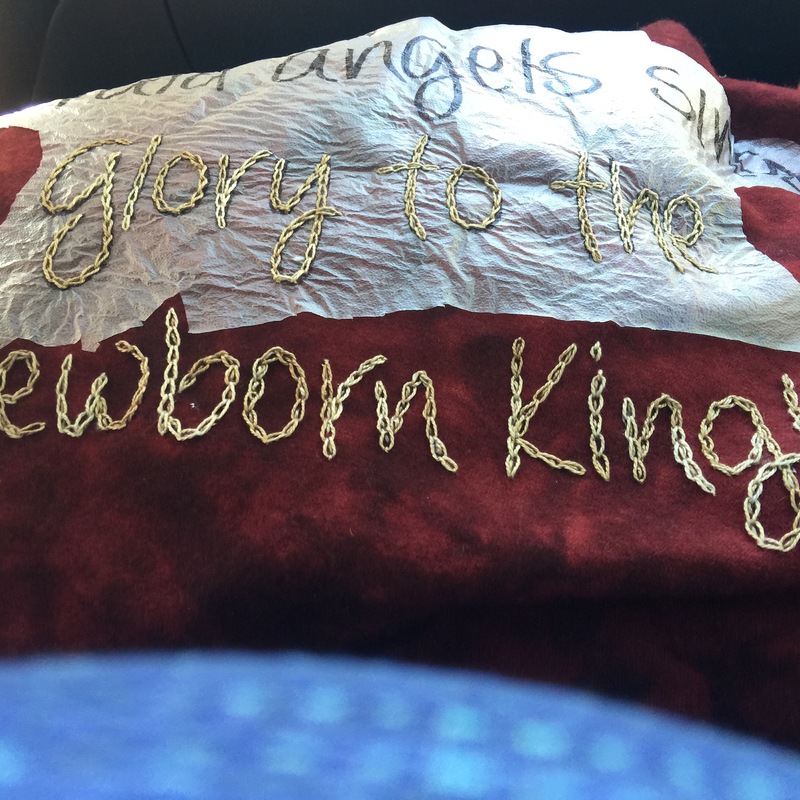 I can’t wait to show you how this large tree skirt turns out…it’s a monster but will be so beautiful under a tree! 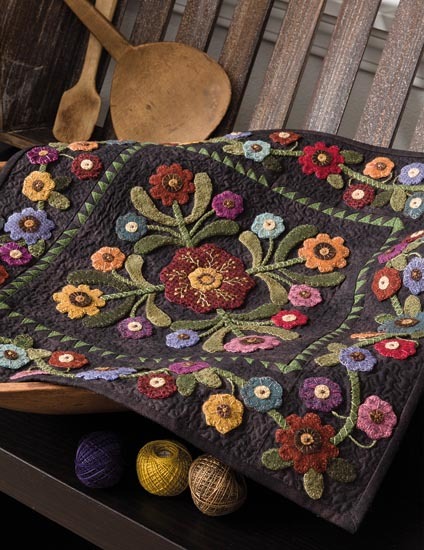 If you would like a kit for the large tree skirt we can get that info to you…I have not figured it out yet as I usually don’t until the project is finished…but I wanted to share this with you while I was stitching. Email us or comment on this post and we will get the kit info to you when it is ready. 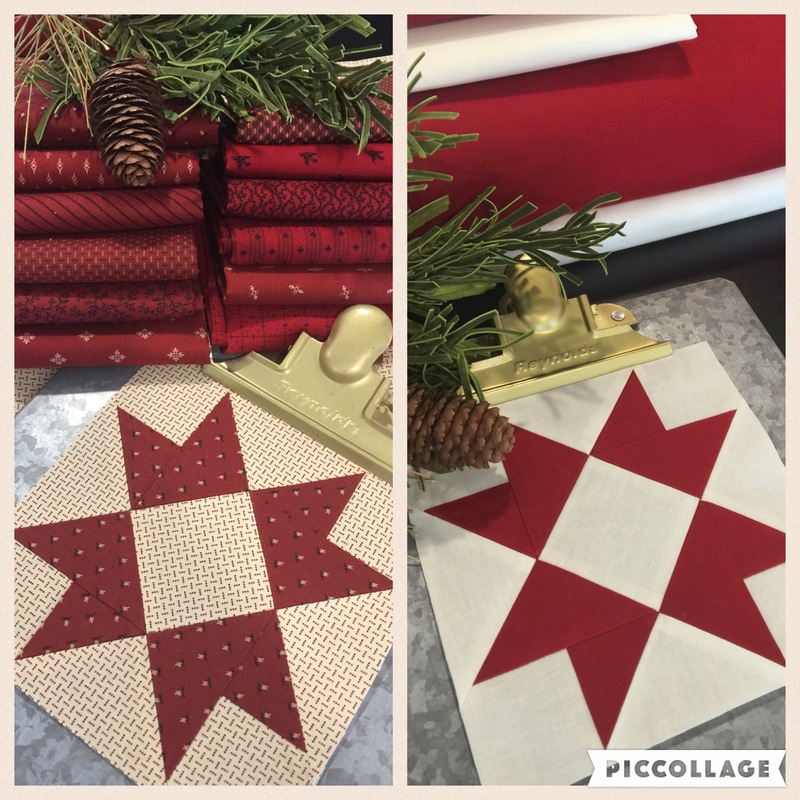 I will be posting soon about…The Magic of Christmas…a 25 block red/white (city) or reds/cream (country) stitch along…. Please send me information on the larger tree skirt. just beautiful! I’ve heard about the PnS and this was a great demonstration. I’m hoping to meet you in Maine and I’m really excited you have a booth there! What an awesome tree skirt, I love it and it has inspired me to try one this year. I just made the mini tree skirt and used the PnS method for the first time. I agree with everything you said in your post. The worst part is picking the PnS out of the lettering, but it works fairly well with a sharp tweezers and some patience. This is a beautiful project that goes together well! 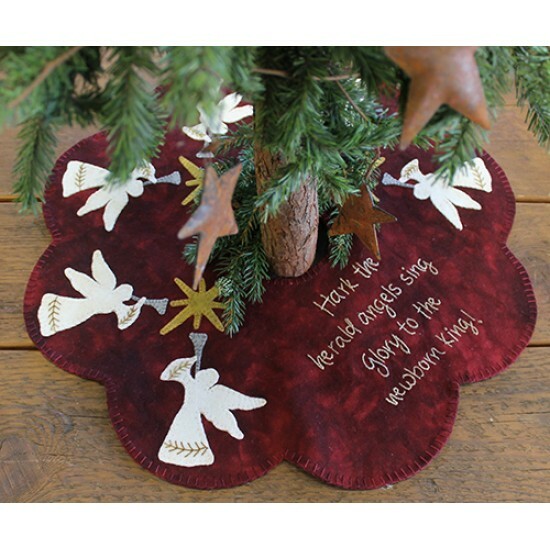 I would be interested in the information for the full sized Angel Tree Skirt kit when you have it. Love the deep rich red if that wool background! I use transfer eze for all my embroidery. 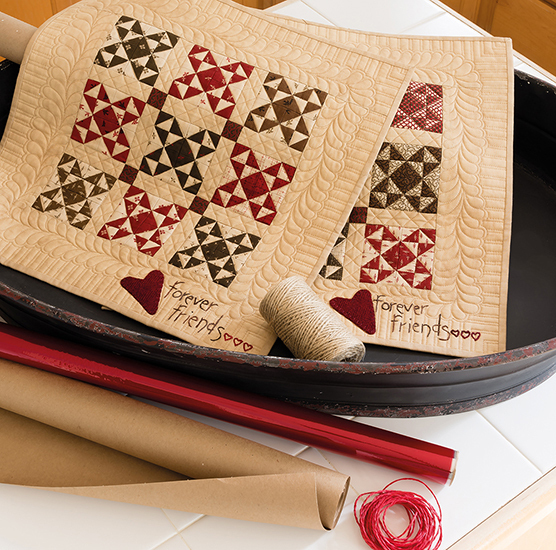 Just copy your embroidery designs or words via a printer onto the transfer eze and press it on your fabric. It dissolves in water leaving no trace! It is similar to the press and stick but don’t have to pick anything off. So if you don’t mind dunking your piece into water… Thanks for the tip, I will have to keep a box in my sewing room next to my freezer paper. Your stitches are gorgeous! curious who told you about that trick Lisa? We learned it from Debbie Busby at Wooden Spool Design in OR. I use fabrisolvy. I have never had a problem rinsing my project in warm water to remove the product. Fabulous tutorial. Thank you Lisa. Love the info – as you know we each have our own way we like. My favorite is Sulky wash away. It sticks to the fabric – washes away with ease and can print right through your printer. It’s awesome…. Thanks for the pointer on small stem stitch for small lettering and chain stitching for the bigger lettering. Can’t you use transfer-ease film? It dissolves when sprayed with water. I’v used PnS for all the words in “Words to Live By” and a stem stitch. They came out perfect. I don’t mind picking out the small pieces with tweezers to get my lettering pretty. Use it for curly stems and vines too. Thanks for the tips! I would love a kit for the large version of the tree skirt, so please add me! Please send me information on the large tree skirt! I love reading all the comments. Lisa, you mentioned outlining your words but I can’t seem to see where you did that. Perhaps I’ll see it on another project. I’ll keep looking….. So glad you shared info about using PnS as I have never tried that. Beautiful tree skirts- both of them. 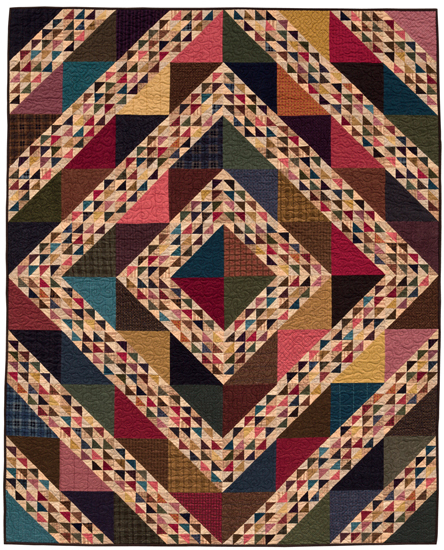 Also I’m keeping an eye out for The Magic of Christmas quilt. Love the creams and reds. Lisa you do beautiful work! And you are a kind teacher. 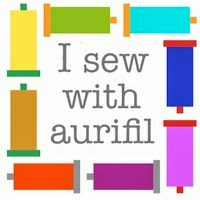 I’ve taken your classes, you deserve to be on the cover for all your contributions to quilting and sewing.Thanks! Thanks so much Lisa for all your information. I love how I get the opportunity to learn new things. Yes please let me know when the large tree skirt kit is available. I just purchased the small one. I put up about 8 xmas trees every year, 5 of them in my entryway all sizes. Plus they make nice gifts. Great ideas! It is always so tricky to transfer onto dark fabrics. I have used the Sulky white transfer pen to transfer markings onto dark wools. You trace the design (reversed) onto paper with the liquid pen and then iron it onto your fabric. The thing you need to remember though is that it is permanent so if you aren’t using light thread it might show through and also you have to trace everything reversed. I haven’t used it for embroidering lettering but it is really good to use when you have to transfer a design for needle felting with wool roving. May I ask if you used a hoop to keep the P&S tight. Nope..i do not use a hoop with wool appliqué!!! I wish I had thought of this when doing my lettering on last summer’s freebie. I may take mine out and do it this way. Mine doesn’t look as nice as I would like.